The acute respiratory distress syndrome (ARDS) is a frequent, life-threatening disease in which a marked increase in alveolar surface tension has been repeatedly observed. It is caused by factors including a lack of surface-active compounds, changes in the phospholipid, fatty acid, neutral lipid, and surfactant apoprotein composition, imbalance of the extracellular surfactant subtype distribution, inhibition of surfactant function by plasma protein leakage, incorporation of surfactant phospholipids and apoproteins into polymerizing fibrin, and damage/inhibition of surfactant compounds by inflammatory mediators. There is now good evidence that these surfactant abnormalities promote alveolar instability and collapse and, consequently, loss of compliance and the profound gas exchange abnormalities seen in ARDS. An acute improvement of gas exchange properties together with a far-reaching restoration of surfactant properties was encountered in recently performed pilot studies. Here we summarize what is known about the kind and severity of surfactant changes occuring in ARDS, the contribution of these changes to lung failure, and the role of surfactant administration for therapy of ARDS. The acute respiratory distress syndrome (ARDS) describes an overwhelming inflammatory reaction within the pulmonary parenchyma leading to life-threatening disturbances in pulmonary vasomotion, alveolar ventilation, and gas exchange. Originally, this syndrome was described in 1967 by Ashbaugh and collegues . According to the recent American–European Consensus Conference , ARDS is defined by an acute onset (catastrophic event), an oxygenation index (ratio of the partial pressure of arterial oxygen to the fraction of inspired oxygen [PaO2/FiO2 ]) < 200 mmHg, bilateral infiltrates on chest radiography, and a pulmonary capillary wedge pressure <18 mmHg or absence of clinical evidence for left-sided heart failure. When the PaO2/FiO2 ratio is between 200 and 300 mmHg and the other above-mentioned criteria are met, the term 'acute lung injury' (ALI) should be used instead of ARDS. ARDS is a frequent disease (incidence between 13.5  and 75 per 100,000 ), thus affecting about 16–18% of all patients ventilated in the intensive care unit . Despite recent progress in the understanding of the disease and numerous efforts to develop causative or symptomatic treatment options, ARDS still has a high mortality rate of about 30–40% . ARDS may develop after a direct injurious attack on the lung parenchyma (direct ARDS) or may result from inflammatory processes carried into the lung via the pulmonary vasculature (indirect, 'classic' ARDS; see Supplementary Table 1). Inhaled or aspirated noxious agents, e.g. toxic gases or gastric contents, induce an inflammatory response in the epithelial and later the interstitial and endothelial compartments of the lung. On the other hand, numerous systemic disorders may induce an overwhelming inflammatory response that may be transferred to the lungs via cellular and humoral mediators entering the pulmonary circulation . One such trigger mechanism is sepsis, leading to respiratory distress in about 43% of these sepsis patients . In the early, exudative, phase of ARDS, the massive, self-perpetuating inflammatory process involves the entire gas exchange unit (see Supplementary Fig. 1). Pathophysiologically, this phase has four characteristics: an increase in capillary endothelial and/or alveolar epithelial permeability; leakage of plasma protein, with flow of edematous fluid into the interstitial and, later, the alveolar spaces; vasoconstriction and microembolism or microthrombosis in the vascular compartment, and thus increased pulmonary vascular resistance, with maldistribution of pulmonary perfusion; and an increase in alveolar surface tension favoring alveolar instability with formation of atelectasis and ventila-tory inhomogeneities. As a consequence, a profound ventilation/perfusion (V/Q) mismatch, with extensive intrapulmonary shunt flow and highly impaired gas exchange, is regularly seen. This exudative phase may persist for about a week, during which full recovery without persistent loss of lung function is very possible  (see Supplementary Fig. 1). However, new inflammatory events, such as recurrent sepsis or acquisition of secondary (nosocomial) pneumonia, may repetitively worsen the state of lung function and then progressively favor proliferative processes characterized by mesenchymal cell activation and ongoing lung fibrosis  (see Supplementary Fig. 1). Fibroproliferative events such as increased collagen matrix production occur early in the course of ARDS (about 5 to 7 days after the onset ) and may lead to irreversible, restrictive abnormalities of lung function. In addition, the development of pulmonary fibrosis and deposition of extracellular collagen in the alveolar space correlates with an increased risk of death in ARDS [11,12] (see Supplementary Fig. 1). Schematic illustration of trigger mechanisms leading to acute respiratory distress syndrome (ARDS). Four key pathophysiological and clinical findings are encountered in ARDS: firstly, noxious agents may attack the alveolar compartment directly or hit the lung via the intravascular compartment (indirect, classical ARDS). Secondly, during the early exudative phase, a self-perpetuating inflammatory process involves the entire gas exchange unit leading to type II cell injury, loss of epithelial (and endothelial) integrity, alveolar edema formation, and severe impairment of surfactant function. Thirdly, as a result a ventilation-perfusion mismatch with extensive shunt flow is observed. Fourthly, aggravating complications including new inflammatory events, such as recurrent or persistent sepsis, or acquisition of secondary (nosocomial) pneumonia may repetitively worsen the state of lung function and then progressively favour proliferative processes characterized by mesenchymal cell activation and ongoing lung fibrosis. infl., inflammatory, interst., interstitial. Pulmonary surfactant is a lipoprotein complex covering the alveolar surface of all mammalian lungs . By profoundly reducing the surface tension at the air–water interface, it makes alveolar ventilation and gas exchange feasible at physiologic transpulmonary pressures and prevents alveoli from collapsing, in particular during expiration. Pulmonary surfactant consists of about 90% lipids and about 10% proteins. Of the lipids, about 10–20% are neutral. The rest (80–90%) are phospholipids (PLs), of which about 80% are phosphatidylcholine, which contains an unusually large amount of palmitic acid residues (about 50–60% of all phosphatidylcholine molecules are dipalmitoylated [DPPC]) and about 10% are phosphatidylglycerol. Other PLs regularly found in low percentages are phosphatidylethanolamine, phosphatidylserine, phosphatidylinositol, and sphingomyelin. Four surfactant-specific apoproteins have been discovered so far, called surfactant apoprotein (SP)-A, SP-B, SP-C , and SP-D . SP-B and SP-C are extremely hydrophobic, low-molecular-weight proteins, whereas SP-A and SP-D are hydrophilic, high-molecular-weight proteins belonging to the family of collectins (C-type lectins). Upon the inspiratory stretch of the alveolar cell layer, alveolar type II pneumocytes secrete surfactant-containing lamellar bodies into the alveolar hypophase, which are then reorganized into the highly surface-active tubular myelin  and large, multilamellar vesicles. Lamellar bodies, tubular myelin, and large, multilamellar vesicles are called large surfactant aggregates (LAs). Adsorption of PLs to the air–water interface results in the formation of a stable PL film. During breathing, when the surface film is compressed and re-expanded, film compounds are squeezed out, leading to a dense packing of 'rigid' lipid material such as DPPC and thus to extremely low surface tension values (near 0 mN/m). Next to DPPC and phosphatidylglycerol, the hydrophobic apoproteins SP-B and SP-C seem to play an essential role for these adsorption facilities and dynamic surface-tension-lowering properties . Additional functions of the alveolar surfactant system include prevention of alveolar edema  and a pronounced influence, especially of the collectins SP-A and SP-D, on pulmonary host defense mechanisms (reviewed [18,19]). Surfactant deficiency has been established as the primary cause of the respiratory failure in infant respiratory distress syndrome (IRDS) , and transbronchial application of surfactant preparations has become the gold standard for the treatment of this disorder . In ARDS, however, surfactant deficiency seems not to be of major importance; rather, a broad spectrum of biochemical and biophysical surfactant abnormalities contributes to respiratory failure. The first, indirect, evidence of a severe impairment of surfactant function in ARDS was provided in 1979 by Petty and co-workers, who examined lungs from patients who had died from respiratory failure . In more recent studies, using bronchoalveolar lavage fluid (BALF) from ARDS patients, impairment of the surface-tension-lowering properties was consistently noted [23,24,25,26], with minimum surface tension values being increased to 15–20 mN/m, instead of <5 mN/m as observed in healthy volunteers (Fig. 2). Similarly elevated values were found for surfactant samples obtained from patients at risk of ARDS . Unlike the case in IRDS, in which the initial lack of surface-active material triggers the pathophysiologic sequelae, more complex changes of the biophysical and biochemical surfactant properties were noticed: these included alteration of the PL and fatty acid profile, decreased levels of surfactant apoproteins, reduced content of LA, inhibition of surfactant function by leaked plasma proteins, and inhibition by inflammatory mediators. Biophysical surfactant properties of isolated large surfactant aggregates from healthy volunteers (Control) and patients with cardiogenic lung edema (CLE), ARDS (with extrapulmonary trigger), severe pneumonia necessitating mechanical ventilation (PNEU), or ARDS and lung infection (ARDS + PNEU). 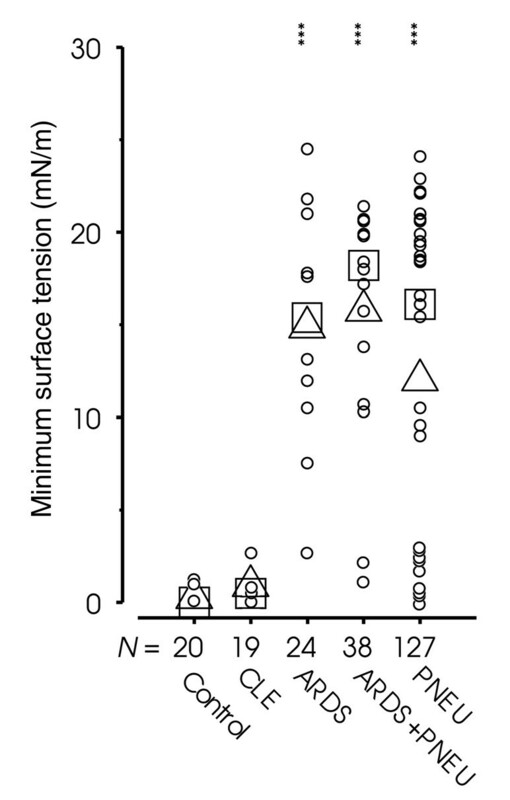 Surface tension [mN/m] at minimum bubble size after 5 min of film oscillation (γ min) is given (pulsating bubble surfactometer, at 2 mg/ml phospholipid). Single events (circles), means (triangles), and medians (squares) are indicated. ***(P < 0.001). From , with permission. Clinical studies addressing the PL composition of BALF samples from patients with ARDS [23,24,25,26] revealed three important features (Table 1). Firstly, in two of four studies, the overall PL content was reduced. Secondly, a significant change in the relative distribution of the PL classes was noted throughout, including a marked decrease in phosphatidylglycerol levels (by >80% in three of the studies) and a compensatory increase in the relative amounts of the minor components (phosphatidylinositol, phosphatidylethanolamine, phosphatidylserine, sphin-gomyelin). However, phosphatidylcholine, the most abundant PL, was reduced only moderately throughout the studies. Thirdly, the relative amount of palmitic acid, the major fatty acid of phosphatidylcholine, was significantly decreased, to about 80% of control values, whereas the relative amount of unsaturated fatty acids in this PL was increased . The relative amount of DPPC, the most abundant single surfactant component, was dramatically reduced (to half that in controls). aBALF post sucrose density gradient centrifugation at 100,000 × g (lipid-protein complex) was used. bOriginal BALF after cell separation (300 × g) was used. cCell-depleted BALF post centrifugation at 48,000 × g ('crude surfactant pellet') was used. The relative amount (mean values) of each PL is given as percentage of total PL. *P < 0.05, **P < 0.01, ***P < 0.001. BLAF = bronchoalveolar lavage fluid; LPC = lysophosphatidylcholine; n.d. = not determined; PC = phosphatidylcholine; PE = phosphatidylethanolamine; PG = phosphatidylglycerol; PI = phosphatidylinositol; PNEU = pneumonia; PS = phosphatidylserine; Sph = sphingomyelin. Because of the late detection of surfactant apoproteins and – in the case of SP-B and SP-C – their extreme hydrophobic nature, appropriate analytical techniques for the quantification of these essential compounds under clinical conditions have only recently become available. Four studies measuring them in patients with ARDS demonstrated an impressive decline of SP-A, but not of SP-D [24,25,26,28] (Table 2). Concentrations of SP-B and SP-C were markedly reduced in the original BALF from ARDS patients  and particularly within the LA fraction [25,29]. SP-A and SP-B levels remained depressed for at least 14 days after the onset of ARDS . Interestingly, a decrease of these functionally important compounds was also observed in patients at risk for ARDS [25,28] (see Table 2). aBALF was centrifuged for cell removal; concentration is indicated for original lavage fluid. bCell-free BALF was concentrated by centrifugation at 48,000 × g; concentration is indicated for 'crude surfactant pellet'. Values are means. *P < 0.05, **P < 0.01, ***P < 0.001. BALF = bronchoalveolar lavage fluid; n.m. = not measured; PNEU = pneumonia; SP-A/B/D = surfactant apoprotein A/B/D. The reported changes of the biochemical surfactant composition (PLs, fatty acids, apoproteins) in ARDS are likely to reflect injury of alveolar type II cells, with consequently altered metabolism or secretion of lipid and apoprotein by these cells. Under physiologic conditions, some 80–90% of the extra-cellular surfactant material is recovered in the LA fraction that is characterized by a high SP-B content and excellent surface activity. However, in experimental lung injury  and in acute inflammatory lung diseases (severe pneumonia, ARDS) [26,29,31], an increase of small surfactant aggregates is is paralleled by a loss of SP-B and surface activity within the LA fraction. These small aggregates are far less surface-active and are considered to represent degradation products of the interfacial film. The underlying reason for this imbalance in the distribution of surfactant subtypes is poorly understood. Decreased secretion of freshly synthesized or recycled surfactant material by alveolar type II cells, degradation of LAs due to inflammatory mediators, and accelerated large-to-small surfactant aggregate conversion are offered as putative mechanisms. Concerning the latter, the requirement of an enzymatic activity was proposed on the basis of inhibitor studies employing serine protease inhibitors . A diisopropylfluorophosphate-binding protein, later named 'convertase', was isolated from BALF, purified, and characterized as a member of the carboxylesterase family [33,34]. The physiologic substrate of the esterase, however, is presently unknown. Because of the broad substrate specificity of carboxylesterases, lipids and proteins could both be targets. The assumption that DPPC, the most abundant and biophysically most important PL, is the substrate was recently disproved . Other data suggest that SP-B may be a candidate for the convertase attack, thereby promoting LA conversion [29,36]. At present, there is no information available as to the regulation of the convertase in acute or chronic inflammatory lung diseases (see Supplementary Fig. 3). Diagram of changes in the surfactant subtype distribution in acute respiratory distress syndrome (ARDS). Under physiological conditions, some 80–90% of the extracellular surfactant material is in the large surfactant aggregate fraction, which has a high surfactant apoprotein B (SP-B) content and excellent surface activity (γmin; = minimum surface tension after 5 min of film oscillation). In inflammatory lung disease (as in severe pneumonia or ARDS), the small surfactant aggregates increase as SP-B and surface activity within the large-aggregate fraction decrease. Leakage of plasma proteins into the alveolar space because of impaired function of the air–blood barrier consisting of capillary endothelium and alveolar epithelium is a very early event in the pathogenesis of ARDS and may substantially contribute to surfactant alterations in ARDS. Experimental studies in vitro and in vivo have shown that admixture of blood, serum, plasma, or alveolar washings obtained during states of plasma leakage may severely compromise biophysical surfactant function. Among the proteins involved, albumin [37,38,39], hemoglobin , and in particular fibrinogen or fibrin monomers [37,38,39,41,42] possess strong surfactant inhibitory properties. These studies also showed that the degree of inhibition of surfactant function by fibrinogen depends on the surfactant apoprotein profile. Surfactant preparations lacking the hydrophobic apoproteins are extremely sensitive to fibrinogen inhibition, and less sensitivity is noted in the presence of SP-B and SP-C in near-physiologic quantities [42,43]. In addition, further improvement in protein resistance is achieved by supplementation of PL- and hydrophobic-apoprotein-based surfactants with SP-A . Accumulation of fibrin-rich material ('hyaline membranes') is commonly found in ARDS and other acute or chronic interstitial lung diseases [10,44,45]. In acute or chronic inflammatory conditions, the alveolar hemostatic balance is shifted towards predominance of a procoagulant activity, which is almost exclusively attributable to tissue factor and factor VII [46,47,48]. In contrast, the fibrinolytic activity of the alveolar space was found to be markedly reduced in these conditions, with reduced concentrations of urokinase, the predominant plasminogen activator in this compartment [46,48,49], but elevated activities of plasminogen activator inhibitor 1 (PAI-1) and α2-antiplasmin [46,47,49]. Hence, rapid fibrin formation is to be expected under these conditions. Recently, this group demonstrated loss of surfactant PLs from the soluble phase due to binding to or within fibrin strands when fibrin polymerized in the presence of surfactant material; this loss was paralleled by a virtually complete loss of surface activity  (Fig. 4). By this mechanism, the surfactant-inhibitory capacity of polymerizing fibrin was found to surpass that of soluble fibrin monomers or fibrinogen by more than two orders of magnitude, thus representing the most effective surfactant inhibitory mechanism hitherto described for plasma proteins. Overall, the findings obviously suggest that PLs and hydrophobic apoproteins are incorporated into the growing fibrin matrix, with severe loss of biophysically important surfactant compounds in areas with alveolar fibrin and hyaline membrane formation. In addition, fibrin clots embedding natural surfactant display markedly altered mechanical properties  and reduced susceptibility to proteolytic degradation . Surface activity can be largely restored by application of fibrinolytic agents in vitro  and in vivo , with the release of formerly incorporated surfactant material into the soluble phase (see Fig. 4). Diagram representing inhibition of pulmonary surfactant by fibrin formation and concept of collapse induration. Under physiological conditions the phospholipid lining layer at the air–water interface reduces the surface tension and thereby promotes lung expansion upon inspiration and prevents lung collapse during expiration. In inflammatory diseases (such as ARDS, severe pneumonia) fibrinogen, leaking into the alveolus, is converted into fibrin due to a pronounced procoagulatory actvity in the alveolar compartment. Surfactant function is greatly inhibited by incorporation of hydrophobic surfactant components (PL, SP-B/C) into polymerizing fibrin. Persistence of this 'specialized' fibrin matrix promotes fibroprolifertive processes ('collapse induration'), whereas a complete lysis results in the liberation of intact surfactant material with re-opening of formerly collapsed alveoli. A complex network of humoral or cellular effector systems contributes to the inflammatory response in ARDS. Proinflammatory mediators may be produced locally in the alveolar compartment by activated neutrophils and macrophages, lung epithelial cells, or fibroblasts. Free elastase and collagenase activities [55,56], oxidative inhibition of the alveolar α1-proteinase inhibitor indicating oxygen radical generation, and increased levels of lysophospholipids (in particular lysophosphatidylcholine)  suggesting increased phospholipolytic activity have been encountered in BALF from patients with ARDS. Degradation of SP-A in BALF from ARDS patients was recently observed , indicating a high proteolytic activity in the alveolar compartment under inflammatory conditions. 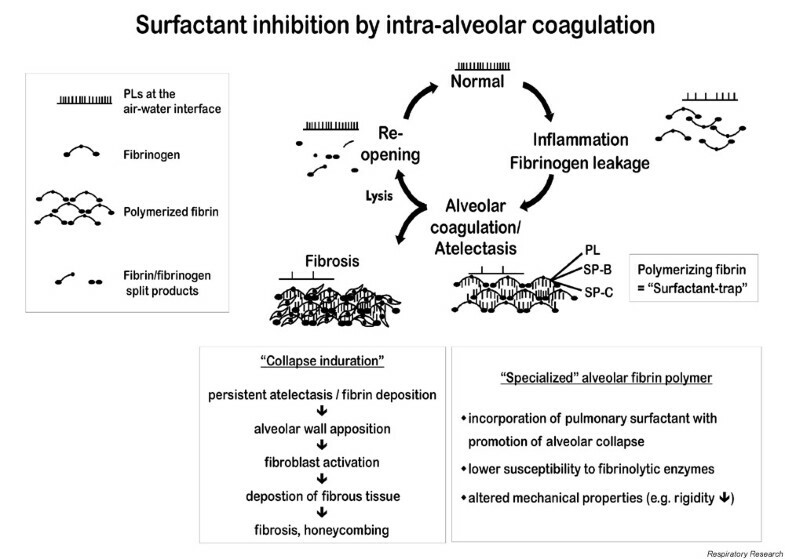 In addition, as summarized in Table 3, a variety of in vitro studies demonstrated a direct surfactant inhibitory effect for various mediators. PL-A2/-C = phospholipase-A2/-C; PMNs = polymorphonuclear neutrophils; ROS = reactive oxygen species; TNF = tumor necrosis factor. As described above, severe alterations of the pulmonary surfactant system have been observed in the course of ARDS, favoring an increase in alveolar surface tension. Thus, the question arises, whether and to what extent these surfactant abnormalities contribute to pathophysiologic events encountered in ARDS. Loss of surface activity leading to an increased alveolar surface tension is assumed to cause alveolar instability and atelectasis. According to the law of Laplace (p = 2 × γ × r-1; where p = pressure, γ = surface tension, and r = radius), an increase in surface tension should result in a marked decrease of lung compliance. This basic finding was described in early reports of altered lung mechanics in patients who died with ARDS . In addition, a marked decrease in compliance was observed in a variety of experimental animal models of ARDS, including disorders induced by administration of oleic acid, N-nitroso-N-methylurethane, or hydrochloric acid, by experimental induction of pneumonia or sepsis, and by repetitive lung lavage [58,59,60,61,62,63,64]. Transbronchial application of surfactant completely or partially restored physiologic lung compliance in some of these models. In patients with severe ARDS, however, lung compliance is still difficult to measure reliably, mostly because of uncertainties concerning lung volume and transpulmonary pressures. In preterm babies with IRDS, where a lack of surface-active material triggers the pathophysiologic sequelae, transbronchial surfactant replacement dramatically improves gas exchange and arterial oxygenation . 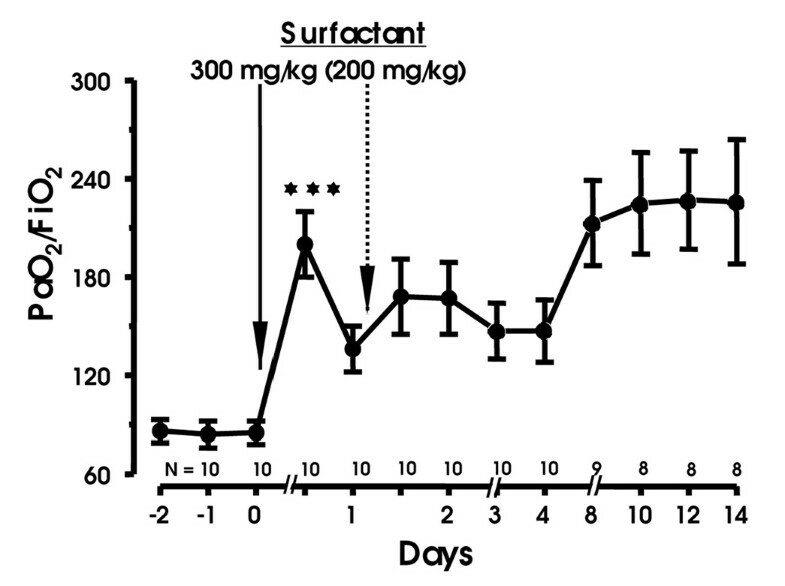 In experimental removal of endogenous surfactant from the lung (repetitive lavage models)  or surfactant inactivation with detergent , gas exchange properties deteriorated severely, and transbronchial application of exogenous surfactant material restored gas exchange and improved V/Q matching. In more realistic models of ARDS, starting with induction of microvascular or alveolar injury, matters are more complex. Shunt flow (perfusion of atelectatic regions) and blood flow through lung areas with low V/Q ratios (dystelectatic lung regions) may well be related to an acute impairment of the alveolar surfactant system. Transbronchial surfactant application was found to improve gas exchange in models with protein-rich edema formation due to cervical vagatomy , hydrochloric acid aspiration [58,60], pneumonia [63,64], and application of N-nitroso-N-methylurethane  or oleic acid . The most obvious explanation for this improvement under experimental and also clinical conditions is the recruitment of formerly collapsed lung regions, with reduction of shunt flow and of V/Q mismatch . However, in these models in which lung inflammation is induced, the efficacy of surfactant replacement is less impressive than in IRDS or IRDS-like models, in which the surfactant depletion is primary. The difference is most likely due to the presence of surfactant-inhibitory agents including leaked plasma proteins and inflammatory mediators, as discussed above. Much larger amounts of exogenous surfactant are needed to overcome such inhibitory capacities. The importance of both epithelial and endothelial injury in the development of alveolar edema has been established. Surfactant alterations, however, also may contribute to the edema. Any increase in surface tension may result in a decrease in interstitial and thus perivascular pressures. Transendothelial and, later, transepithelial fluid movement into the interstitial and, later, alveolar space may increase. Several experimental studies described formation of extensive lung edema due to inhibition of surfactant function in vivo by transbronchially applied detergent , intratra-cheally injected bile acid , cooling and ventilating at low functional residual capacity , or plasma lavage . In some of the studies, transbronchially applied surfactant reduced alveolar flooding . Concerning patients with ARDS, however, there is at present no conclusive evidence that surfactant abnormalities affect lung fluid balance in patients with ARDS. Reduction in host defense competence? Nosocomial infection/ventilator-associated pneumonia is a common complication of ARDS (incidences range from 36.5% to 60%) that adversely affects the prognosis [72,73]. As pulmonary surfactant participates in the alveolar host defense system, alterations of the surfactant system may contribute to an increased susceptibility of these patients to secondary lung infection. At present, the host defense properties of pulmonary surfactant are not fully understood. Suggested mechanisms include direct interaction of surfactant components with pathogens (viruses, bacteria) or their products (e.g. endotoxin, viral glycoproteins); stimulation of phagocytosis by surfactant components (as an opsonin or active ligand); influence of the chemotaxis of immune-competent cells; and regulation of cytokine release and reactive oxygen production by macrophages (reviewed ). The hydrophilic surfactant apoproteins SP-A and SP-D have distinct functions in the innate immune response to microbial challenge. Studies with SP-A knockout mice revealed that these animals are more sensitive to infection with Haemophilus influenzae group B streptococci and Pseudomonas aeruginosa . In addition, the surfactant lipids suppress a variety of immune cell functions, including activation, proliferation, and immune response of lymphoctes, granulocytes, and alveolar macrophages [75,76] and can even promote bacterial lysis . Changes in the protein and/or lipid composition of surfactant may thus effect immunomodulation in the lung. As indicated above, the exact contribution of each surfactant component to the alveolar host defense system remains uncertain. Nevertheless, the marked decrease in SP-A levels [24,25,26,28] and the proof of degradation of SP-A in vivo in the lungs of ARDS patients  suggest a loss of opsonizing capacity and increased susceptibilty to nosocomial infections. During the acute phase of ARDS, full recovery without persistent loss of lung function is possible . However, some patients progress to a fibroproliferative phase, characterized by mesenchymal cell activation and proliferation, with synthesis of extracellular matrix components such as collagen, formation of new blood vessels, and bronchiolization . Within a few weeks, structural remodelling of the lung leads to widespread lung fibrosis and honeycombing. The onset of the fibroproliferative response is an early event in ARDS [78,79] and correlates with the outcome. The pathologic mechanisms underlying such a rapid fibroproliferative response to an acute inflammatory event have not been fully elucidated. In addition to inflammatory cells , cytokines [81,82] and growth factors (in particular transforming growth factor β ), abnormalities of the pulmonary surfactant system, and deposition of fibrin in the alveoli may contribute to the development of fibrosis and honeycombing (Fig. 4). According to the concept of 'collapse induration' as suggested by Burkhardt , lung fibrosis preferentially occurs at sites of persistent atelectasis due to extensive loss of alveolar surfactant function and to 'glueing' of adjacent septae by generation of alveolar fibrin. This specialized alveolar fibrin matrix serves as a nidus for fibroblast invasion, resulting in the deposition of excess extracellular matrix and irreversible loss of alveolar space. Thick, indurated septae (or conglomerates of several septae) may exist adjacent to dilated alveoli, providing the typical morphological image of fibrosis and honeycombing . Additionally, thrombin [84,85], fibrinopeptides A/B , and fibrin(ogen) scission products  have been shown to serve as potent fibroblast mitogens. Against this background of surfactant abnormalities and their contribution to the pathophysiology of ARDS, improvement of alveolar surfactant function appears to be a reasonable approach to restore gas exchange properties and lung compliance. Such attempts may include pharmacological approaches to stimulate secretion of intact surfactant material from type II cells, protection from degradation of surfactant compounds, and inhibition of large-to-small aggregate conversion, but evidence that these approaches are effective in acute respiratory failure is still lacking. As in IRDS, transbronchial application of exogenous surfactant may be used in ARDS to restore surfactant function in inflamed lungs, but larger quantities may be needed to overcome the inhibitory (proteinaceous) burden in the alveolar compartment. A further rationale for such an approach is provided by various animal models of acute lung injury in which treatment with surfactant improved gas exchange and outcome. So far, six pilot studies addressing the safety and efficacy of transbronchial surfactant administration in ARDS have been completed (Table 4). ↓ = decreased; ↑ = increased; ~ = unchanged; BALF = bronchoalveolar lavage fluid; b.w. = body weight; FiO2 = fraction of inspired oxygen; n.s. = not significant; PaO2 = partial pressure of arterial oxygen; (P)ICU = (pediatric) intensive care unit; rSP-C = recombinant surfactant apoprotein C. Venticute is a synthetic surfactant preparation with a standardized PL and rSP-C content; the dosage in pairs refers to the dosage of rSP-C in the PL preparation. This information is not available for other preparations, since they are organic extracts with varying and unknown contents of hydrophobic apoproteins. Upon repeated intratracheal administration of Survanta®, a natural bovine surfactant preparation, with cumulative doses between 400 and 800 mg/kg body weight (b.w. ), Gregory et al. noted significant improvement in gas exchange and obtained a trend towards reduced mortality in adults with acute respiratory failure . BALF analysis revealed partially improved surfactant functions. The safety and efficacy of a bronchoscopic application of another bovine surfactant preparation (Alveofact®) were studied in 10 patients with severe, sepsis-induced ARDS, in an uncontrolled, multicenter study . The surfactant, 300 mg/kg b.w., was delivered through a flexible bronchoscope in divided doses to each segment of the lung. In response to the first administration, the PaO2/FiO2 increased from 85 to 200 mmHg (Fig. 5). 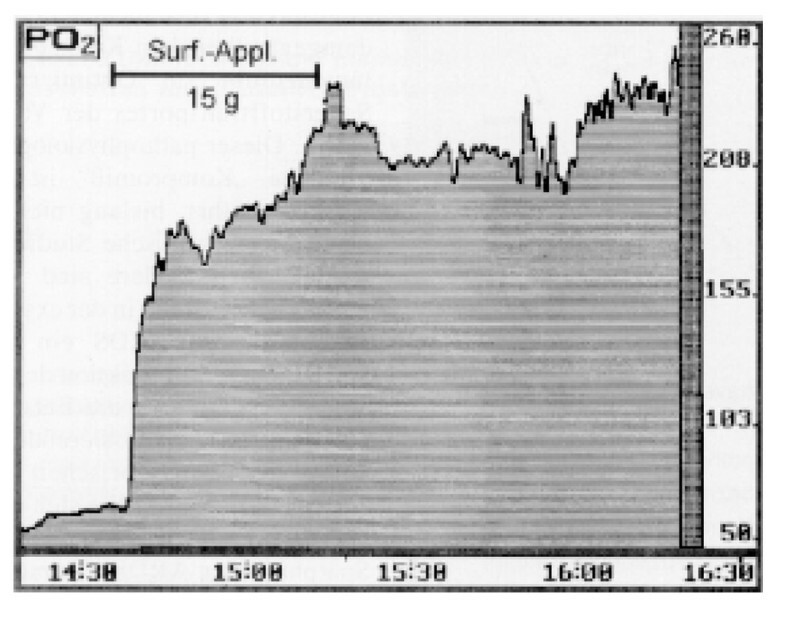 In some patients, this improvement in gas exchange was already evident during the application procedure (Fig. 6). Analysis of V/Q characteristics (multiple inert gas elimination technique, MIGET) revealed that treatment resulted in recruitment of formerly collapsed alveoli, reducing the intrapulmonary shunt flow (from 41.7% at baseline to 19.8% post surfactant) and increasing blood flow through regions with low and normal V/Q ratios. Patients in whom the initial increase in PaO2/FiO2 was partially lost received a second, smaller, dose of surfactant, resulting in prolonged improvement of arterial oxygenation. In addition, the treatment produced a far-reaching, though incomplete, restoration of the severely altered biochemical and biophysical surfactant properties. Time course of the PaO2/FiO2 ratio in 10 patients with ARDS upon transbronchial application of 300 and 200 mg/kg body weight of a surfactant extract from calf lung. ***P < 0.001, as compared with baseline value. From , with permission. Example of the course of PaO2 in response to transbronchial surfactant application in an 18-year-old female with severe sepsis-induced ARDS. The original on-line recording of the PaO2 at a constant FiO2 of 1.0 after administration of a surfactant extract from calf lung (Alveofact®, 300 mg/kg body weight) is shown. The PaO2 increased from about 60 mmHg (baseline) to about 220 mmHg after surfactant application. From , with permission. In a more recent, phase II, study in Europe and South Africa, the feasibility and efficacy of a tracheal application of a surfactant preparation based on recombinant SP-C (Venticute®) was studied in patients with ARDS . Patients were randomized to receive either standard therapy alone (STD group) or standard therapy plus recombinant SP-C surfactant (MID group, up to 200 mg/kg total PL, in four doses; HIGH group, up to 500 mg/kg total PL, in four doses). The MID group showed marked improvements in the oxygenation index (mean PaO2/FiO2 184, vs 139 mmHg in STD), ventilator-free days (mean 10.9, vs 1.8 in STD), and percentage of successfully weaned patients (57, vs 25 in STD). Finally, mortality was 29% in the MID and 33% in the STD group. No differences were observed between the HIGH and STD groups. Very recently, a phase III trial using this recombinant SP-C-based surfactant was finished. Astonishingly, surfactant treatment did not result in a significant reduction of ventilator-free days or mortality (28 days). However, the detailed analysis of this study is not completed yet. In another controlled, randomized, unblinded study, the efficacy of a calf-lung surfactant extract (Infasurf®) was investigated in 42 children with acute respiratory failure , most of them fulfilling ARDS criteria. A rapid improvement in oxygenation, reduced duration of mechanical ventilation, and an earlier discharge from the pediatric intensive care unit was observed in the surfactant group. In contrast to these studies, Anzueto and collegues  found no benefit from an aerosol of a synthetic surfactant preparation (Exosurf®) in a large, randomized, placebo-controlled study enrolling 725 patients with sepsis-induced ARDS. However, there are important criticisms. Firstly, the aerosolization technique used did not ascertain a pulmonary deposition of suitably large amounts of surfactant. As measured by the authors themselves, only 4.5% of the applied material reached the lungs, thus yielding a daily dose of 5 mg/kg b.w. This dose is two orders of magnitude below that possibly effective under conditions of a high alveolar protein burden  in ARDS and one order of magnitude below that currently used in IRDS. Secondly, Exosurf® is a fully synthetic surfactant preparation lacking the hydrophobic apoproteins. Apoprotein-free surfactant preparations have been repeatedly shown to be less effective in animal studies and IRDS  than natural surfactant preparations and are extremely prone to inhibition by plasma proteins . In addition, in an attempt to withdraw the inhibitory plasma proteins from the alveolar space, Wiswell and colleagues performed a broncho-alveolar segmental lavage in 12 ARDS patients. For this purpose surfactant based on a synthetic peptide (KL4), mimicking SP-B, was used. In essence, the authors observed an improvement of oxygenation status and positive end-expiratory pressure (PEEP) level after 72 hours. However, the lavage procedure resulted in a temporary (24 hour) deterioration of gas exchange and a need for higher PEEP levels. These early deleterious effects were as pronounced as the later beneficial effects . There is good evidence that severe abnormalities of the pulmonary surfactant system in ARDS contribute to the pathophysiologic sequelae of the disease. Transbronchial application of exogenous surfactant material may offer a feasible and safe approach to improve gas exchange in ARDS and to restore biochemical and biophysical properties of the endogenous surfactant pool. However, a high or repetitive dosage regimen seems needed to overcome the inhibitory capacities of the inflamed alveolar space and to achieve a prolonged recruitment of formerly collapsed lung regions. Further studies will be needed to elucidate the optimum timing, dosage regimen, and application technique, and to establish whether such therapy can reduce mortality in patients with ARDS. Furthermore, the impact of surfactant on inflammation, host defense, and the fibroproliferative response in the alveolar compartment will have to be addressed critically. This work was supported by the Deutsche Forschungsgemeinschaft (DFG) (SFB 547 'Kardiopulmonales Gefäβsystem' and Gu 405/3-1).